The Twitter Fanpage Account of Mr. Public Service Kuya Daniel Razon has now over 8,000 followers. Since joining the community of tweets in November 2015, the Twitter Fanpage has been an active supporter of Kuya Daniel Razon‘s endeavors, promoting and moving supporters over the social media field. 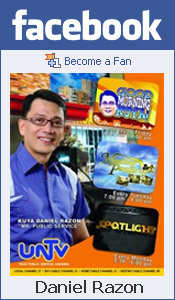 As of January 5 this year, @TeamKuyaDaniel has now over eight-thousand followers – a family still strong and growing. Let us continue to support Mr. Public Service in his endeavors, which are genuine help to society and our fellow people. Congratulations to @TeamKuyaDaniel for your 8,000 followers in Twitter. To God be the glory!